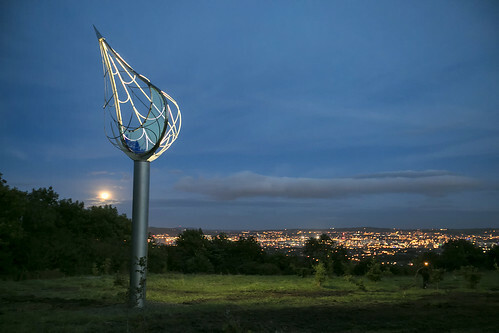 Origin is a 11-metre high public art piece located at Squire’s Hill at the entrance to Cavehill Country Park on Crumlin Road. The sculpture is placed near the source of the Farset, the river that gave Belfast its name. It was designed by the Solas Creative artist team, with input from local communities along the course of the Farset through a series of artist-led engagement workshops. The centrepiece of Origin is a six metre tall raindrop, made from polished stainless steel arcs and stained glass, symbolising the ultimate source of the river. It is suspended above the ground on a brushed stainless steel column, with a granite rippled plinth. This unique piece of public art was constructed from four square meters of toughened Narima glass, 200 meters of stainless steel, 250 kilos of glass, three tonnes of steel and two tonnes of granite. What is the Farset Project? The Farset Project was one of seven Creative Belfast projects jointly funded by ourselves and the Arts Council of Northern Ireland. It was a celebration of the River Farset, which rises in the hills above the city and flows into the River Lagan and which gave Belfast its name, but today has largely been built over and forgotten. The project, which also included a dawn-to-dusk series of events on 30 May 2016, was a cross community initiative delivered in partnership between Culturlann and the Spectrum Centre. This gallery includes photos of the Origin sculpture. If you can’t see this gallery, visit www.flickr.com/belfastcitycouncil to view the photos.